Waasamoo-Beshizi (Power-Lines) is a group exhibition featuring work by 25 contemporary Ojibwe, Dakota, Lakota, Nakota, Eastern Band Cherokee, Seneca, Cree / Flathead, and Ponca women artists. The exhibition recognizes Native women artists as central contributors, shapers, and culture bearers within Native communities and within the narrative of contemporary art. Waasamoo-Beshizi celebrates the connections Native women have to each other and the intergenerational passage of knowledge through visual art and tradition. The title of this exhibition is inspired by powerlines and transmission towers, whose shapes are reminiscent of dresses. Many exhibiting artists engage with weaving, clothing, and textile traditions while reflecting on culture and identity. Clothing can both hide and reveal something about the wearer, can reflect individual and cultural identity, and can celebrate, honor, and remember. This exhibition is curated by Plains Art Museum’s Laura Youngbird, with support from Tasha Kubesh, Netha Cloeter, and Joe Williams. This exhibition was developed as a “Sister Show” connected to the Minneapolis Institute of Art’s exhibition Hearts of our People: Native American Women Artists. Mia’s exhibition is the first major thematic exhibition exploring the artistic achievements of Native women artists, from ancient times to the present. Join us as artists featured in Waasamoo-Beshizi come together for a night of conversation and poetry. Maggie Thompson, Denise Lajimodiere, Hillary Kempenich, Karen Goulet, and moderator Jessica Metcalfe will reflect on their careers, their influences, and themes in the exhibition. Maggie Thompson (Ojibwe) received her BFA in Textile Design from the Rhode Island School of Design. Heid E. Erdrich (Turtle Mountain Band of Ojibwe) is an author, poet, and filmmaker, and teaches in the MFA Creative Writing program at Augsburg College. Hillary Kempenich is an artist and enrolled member of the Turtle Mountain Band of Chippewa Indians. Kempenich received the First Peoples Fund 2016 Artist in Business Grant and Fellowship Award. Dr. Denise Lajimodiere (Turtle Mountain Band of Ojibwe) is an award winning poet, birch bark biting artist and has been an educator for over 39 years. Karen Goulet received her BA in Fine Arts and Cultural Education from the Evergreen State College and MFA in Sculpture from the University of Wisconsin, Madison. She is the program director of Miikanan Gallery at the Watermark Art Center in Bemidji, Minnesota. Dr. Jessica R. Metcalfe (Turtle Mountain Chippewa) is a graduate of Dartmouth College and the University of Arizona. Her doctoral dissertation is of Native designers of high fashion, and is the owner of Beyond Buckskin. 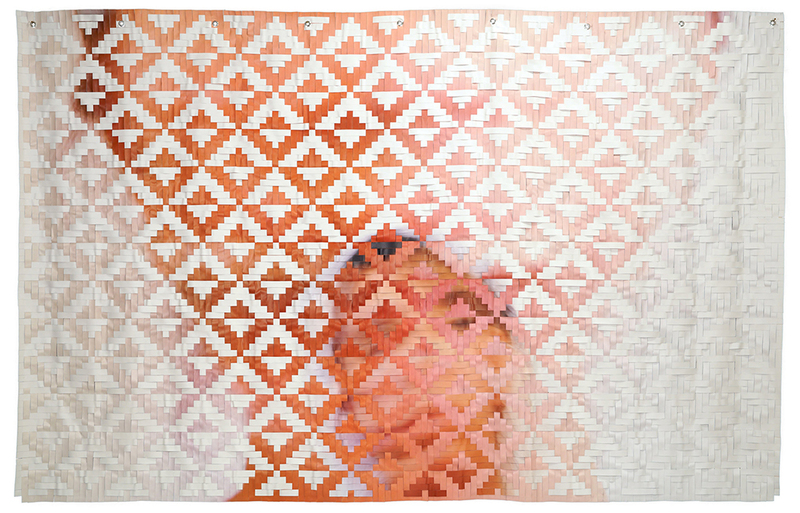 Maggie Thompson, In Loss, 2015, Vinyl, photography, weaving, 9 x 11 ft.